Feel the true tourist experience of the 21st century and download the first cultural video tour guide for an European tourist destination based on high quality georeferenced videos! Thanks to its incorporated videos a personal virtual guide will explain you the most known anecdotes and the historical background of all points of interest. 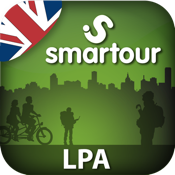 SMARTOUR® will allow you to explore unique places and discover unforgettable stories at your desired pace as well as to get the best direction to take as you follow the route along the most relevant points of interest. You will also be able to enjoy a welcome video to a tourist destination, find the most important information of its different areas, as well as its gastronomic, cultural, commercial and leisure offers and much more. Within our suggested tour along the Spanish city of Las Palmas de Gran Canaria you will discover 21 points of tourist and cultural interest plus 1 video welcoming you to the city. You will enjoy its 4 most outstanding areas as follows: Shopping District of Triana, Historic Quarter of Vegueta, District of Ciudad Jardín & Alcaravaneras Beach and Port & Canteras Beach. -High quality georeferenced videos (through GPS system) of the most emblematic points of interest of a tourist destination. Each video will automatically be reproduced when a point of interest is reached within its programmed radius.